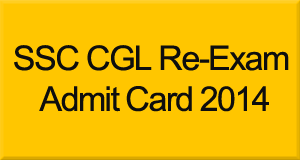 Staff selection commission has released the admit card / call letter for Combined Graduate Level CGL Tier-I 2014 Re-Exam which is scheduled in the month Jan-Feb 2015. There are many candidates waiting for the release of SSC CGL Re-Exam Admit card 2015, now wait is over and it is available to download from the official website of commission for northern region- www.sscnr.net.in. While all the candidates appeared in SSC CGL 2014 (Tier-I) are waiting for their exam result, SSC issued new notification for re-examination for few centers in northern region. So we recommend to all candidates to check their roll number on the website of commission to know about their status and if you are unqualified and selected for re-exam then please take a copy of your Admit card from the link given below. Remember, don’t try to download admit card multiple times, once you download it then don’t download again and again otherwise SSC may block your registration id or block the downloading. Enter your Registration id and date of birth or roll number and date of birth and then click on search status button. In case you forget your registration id and roll number then you can also search your status by using your full name with date of birth. All the best for SSC CGL Tier-I Re-exam 2014.